The Royal Ontario Museum’s Bishop White Gallery is a corner of the museum I have visited often over the past forty years. 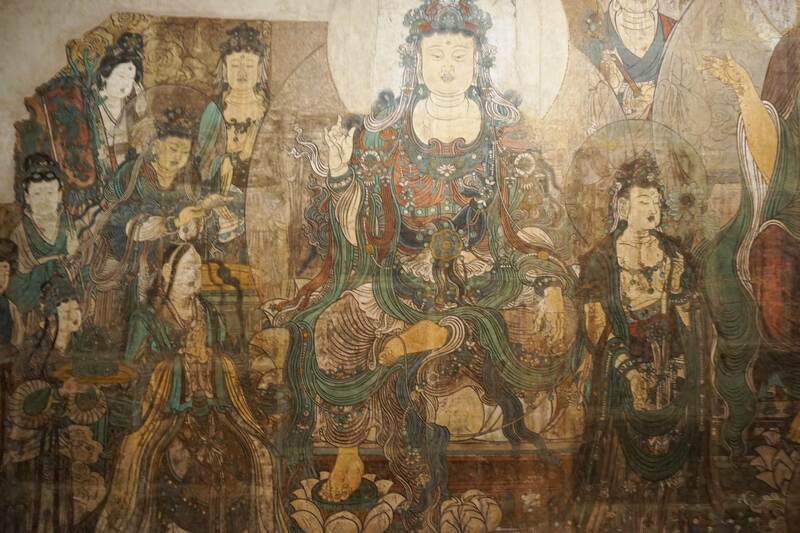 It houses a world-renowned collection of Chinese temple murals and Buddhist and Taoist statuary, most of which date back to the Yuan Dynasty (1271–1368). 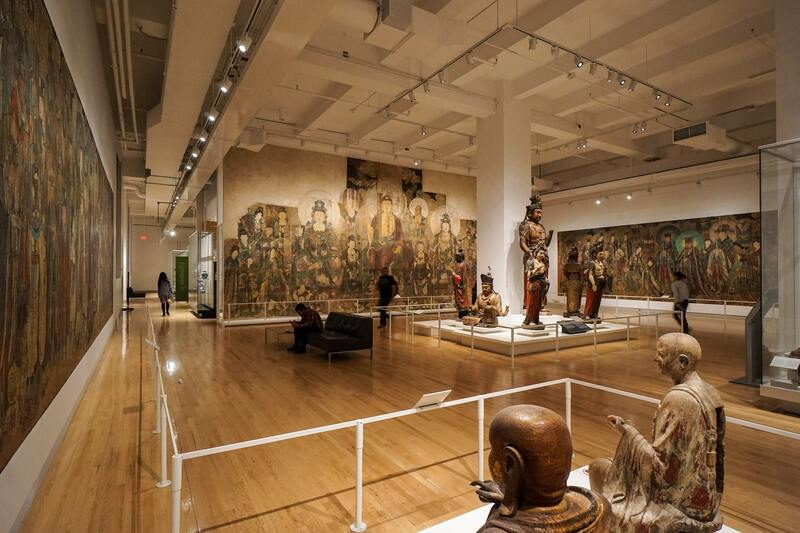 Below is an overview of what there is to see – the three great murals and a collection of wooden Buddhist temple statues on the island in the center. While the space in which the collection has been exhibited since the museum’s glitzy retrofit in 2007 has all the charm of a warehouse, it is still nice to visit old friends! 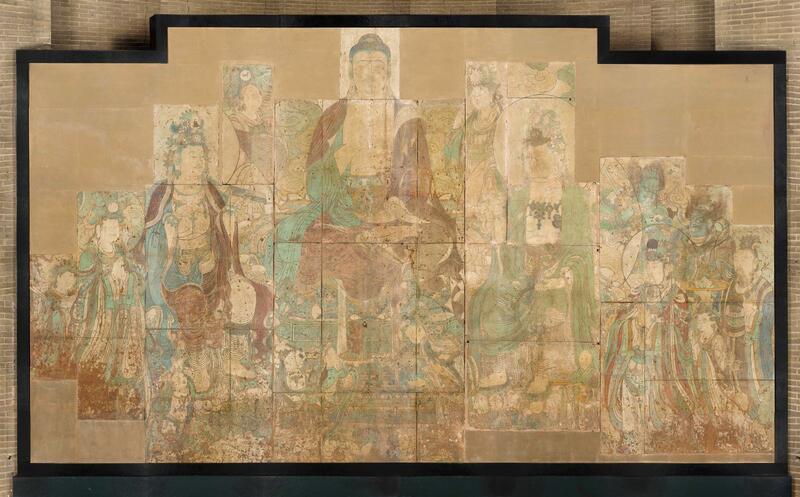 First up are a pair of Yuan Dynasty Taoist murals from Longmen Monastery in Shanxi Province. From stylistic similarities with a similar pair of murals from a nearby monastery, a date of composition around 1325 C.E. is likely. Together the pair is referred to as Homage To The First Principle (i.e. the Tao). They depict a procession of celestial beings of the Taoist pantheon. For outsiders with no idea of who the figures are, the sheer majesty and the sense of order in the scene – as well as the colour – make the biggest impact. What is lacking is a story to pull the viewer in – the very narrative that a Chinese peasant eight hundred years ago would have had no problem providing! 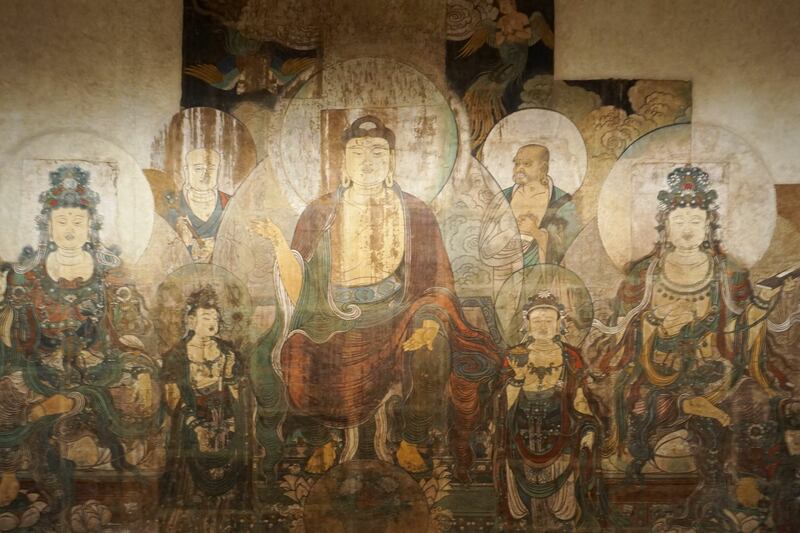 The main figures in one of the murals include the Lord of the Northern Dipper, the Yellow Emperor, the Emperor of Heaven, the Empress of Earth, as well as other deities. 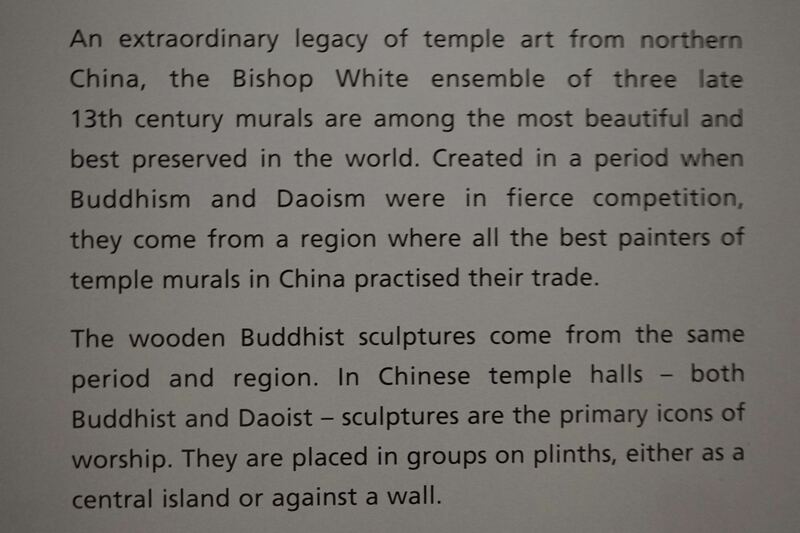 On the other mural – the Lord of the Southern Dipper, Lao Tzu, the Jade Emperor, and the Empress of Heaven! 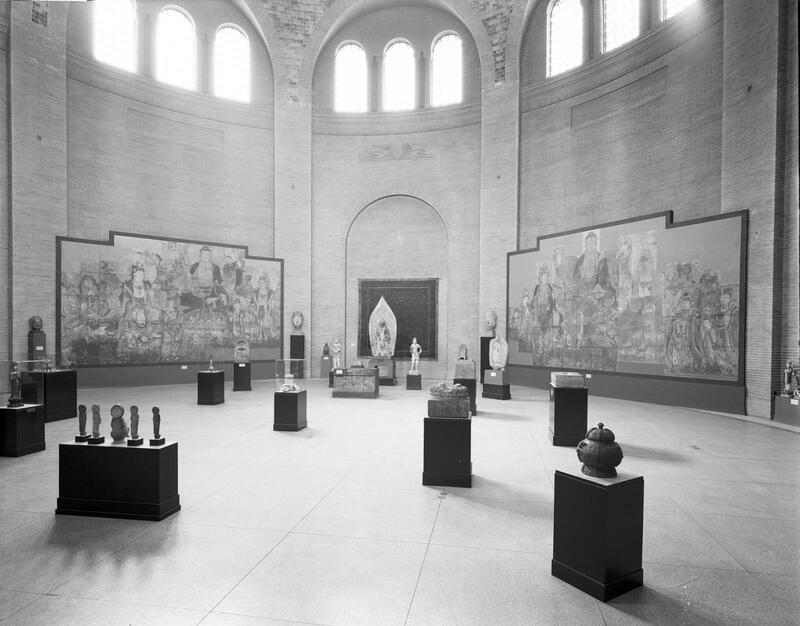 From the two Taoist murals, I turned my attention to the statues arranged around a central column in the middle of the space. In the images above and below is a gilded wooden statue of a seated Dhritarashtra (Chinese: Chiguo Tianwang), the Guardian King of the East. It comes from a temple in Jiang Xian and like many of the other statues dates to the Yuan Dynasty. The “air guitar” placing of his hands is a clue that the statue originally included a lute. 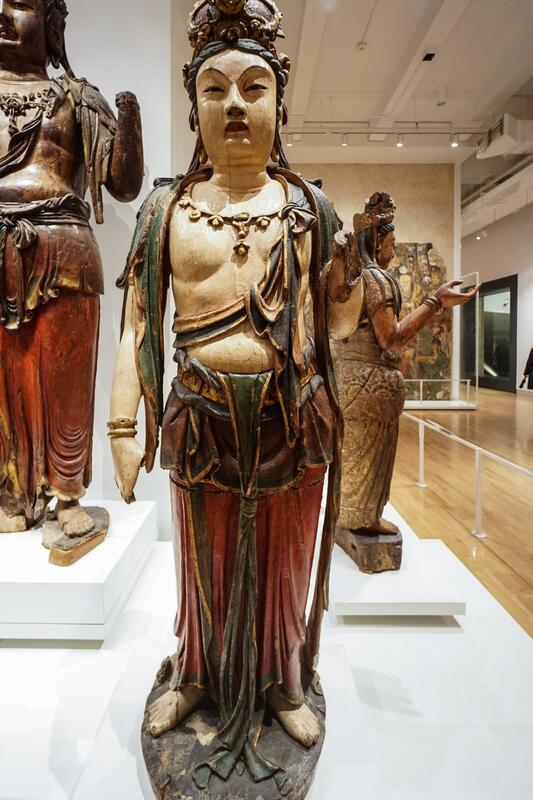 Behind the statue of the Guardian King we see the sides of the single largest statue in the collection – probably of the Bodhisattva Avalokiteshvara – and the pair of wooden statues (one of Dashizhi and one of Kuan Yin) flanking him. I say “him” and admit I am a bit confused! The Chinese name for the Sanskrit Avalokiteshvara is Kuan Yin, who is usually represented in female form. Below is Dashizhi, identified by the crown which has it in what is said to be a vase. I didn’t get a great shot of the complete central statue of the large Kuan Yin figure but here it is from the waist up. Like the two flanking it, the wood statue is painted and gilded. 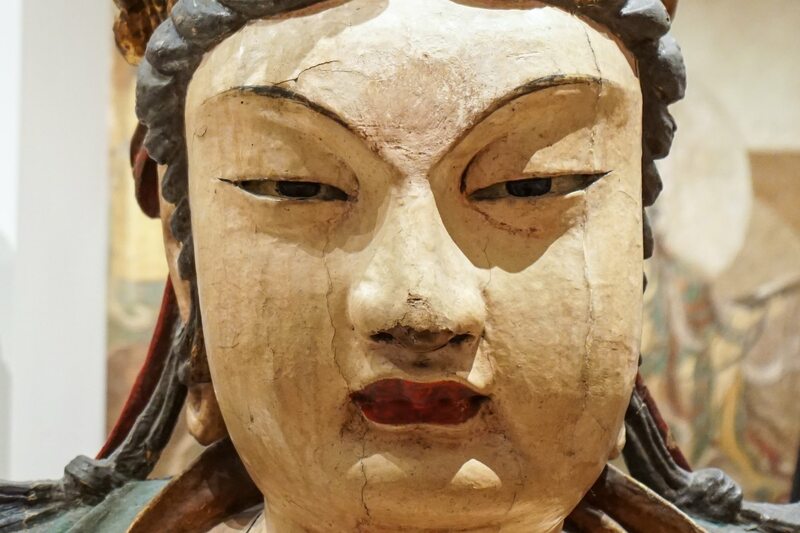 Usually, Kuan Yin figures include a small image of Amitabha in the crown; this one lacks that detail. However, his sheer size makes experts say he is “probably” Kuan Yin! The statue comes from Daning, where it stood in the Great Buddha Hall. I think on my next visit I’ll make a point of getting a better shot! The companion statue to the Dashizhi to the left of the large Bodhisattva figure – also from Linfen in Shanxi Province and dated 1195. It does have a figure of Amitabha in its crown which identifies it as a Kuan Yin. 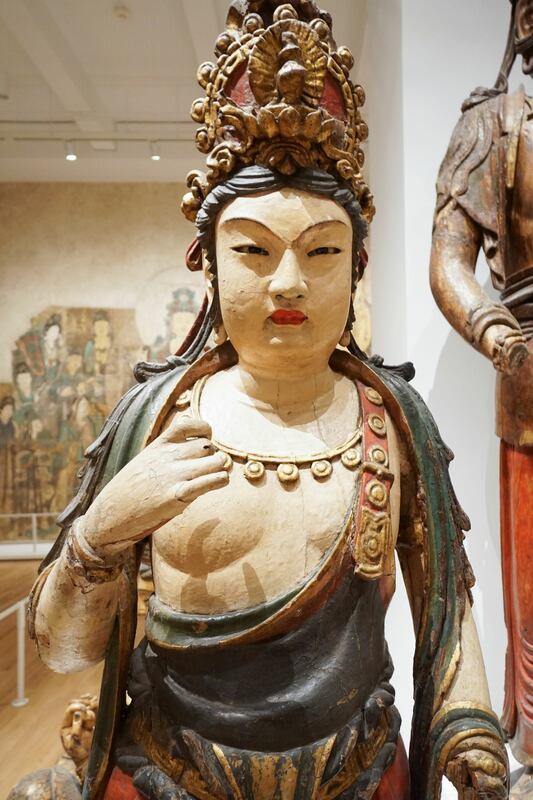 The information board notes that this statue “has been painted at least four times, most recently in the 19th century.” Along with the companion statue to the left, it originally flanked a large central statue of Amitabha. And finally, my favourite stop on the tour! 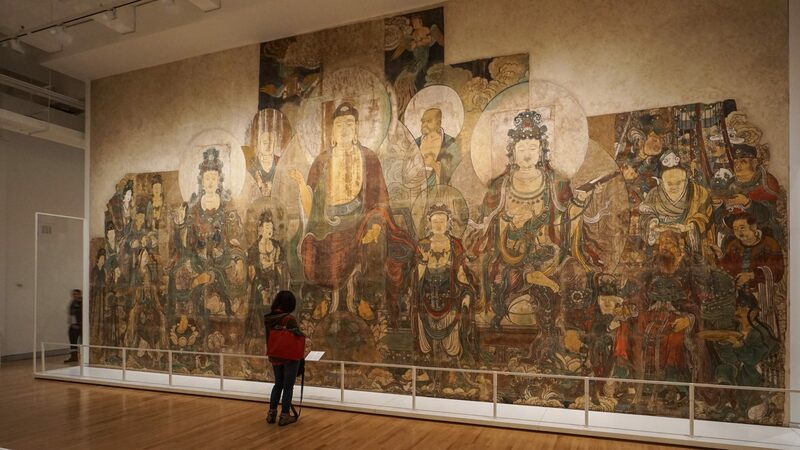 I am standing to the side of the mural titled The Paradise of Maitreya. Unlike the two Taoist murals, this one actually has a narrative that helps me understand what I am looking at. First, I learned that Buddhism, as the Mahayana form of it developed from the original austere form of its first few centuries, has many Buddhas and celestial beings – and not just the historical Buddha known as Siddhartha Gautama who lived north of the Ganges River around 500 B.C.E. I’ve often wondered if the entry into Buddhism of this future saviour figure was a result of the spread into Asia of the Christian myth of the Returning Saviour. Closer to our own time, various people – L. Ron Hubbard and the Raelian cult leader are two of them – have claimed to be Maitreya. Krishnamurti was groomed from an early age for the position by the Theosophist movement. (He would later reject the title.) If nothing else, we have here proof of the power of hope in a better future, a truth that goes right back to the story of Pandora’s box! The seated Maitreya is the central figure. He is in Tusita, the Buddhist Heaven where Bodhisattvas reside before they return to earth to become Buddhas. 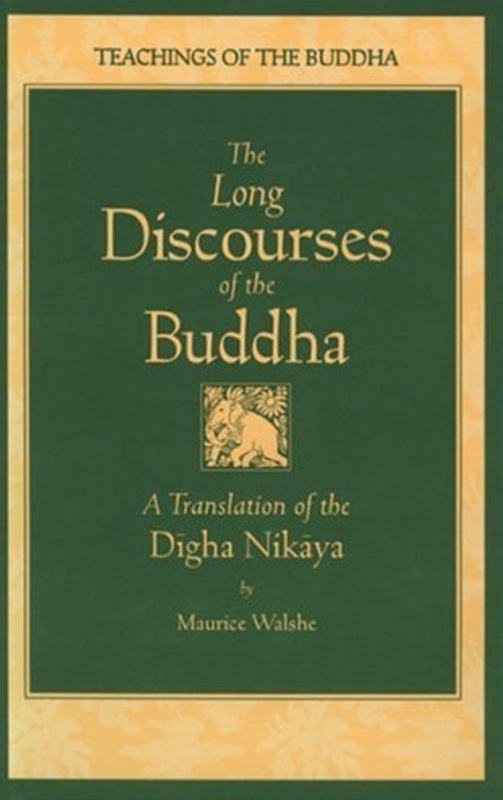 To his sides are bodhisattvas, fully realized beings who in Mahayana Buddhism have postponed their own entry into nirvana to help others achieve it. Behind him are monastic disciples – the shaved heads are a sign of this. Had it been the historical Buddha we might know their names as Ananda and Kashyap. 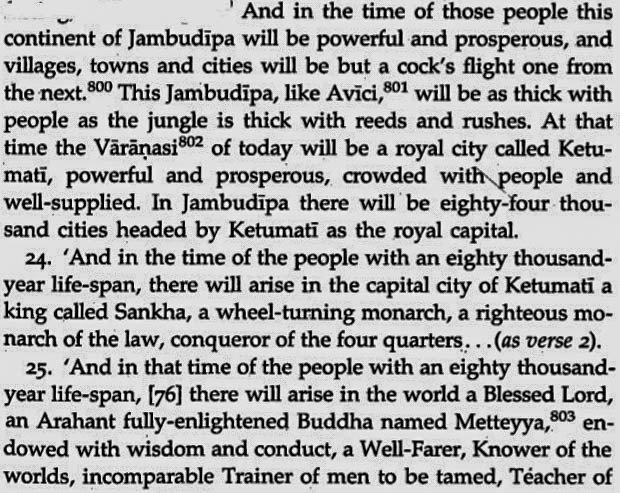 While Ananda remembered and recited all of the Buddha sermons with the “Thus have I heard…” introduction, it was Kashyap who called and directed the first Buddhist Council after Gautama Buddha’s death to ensure the movement continued. So too does Maitreya have his attendant monk and right-hand monk. Other celestial attendants flank him symmetrically on either side. Trying to make sense of all of this will get your head spinning – especially if, like me, you think of the Buddha as just a man who stripped away all the mythology and metaphysical mumbo-jumbo of the religion of his day to present a practical approach to living a meaningful life! I’ve come to realize that the Buddhism I created in my head only exists there and not in the Buddhist societies I have visited. 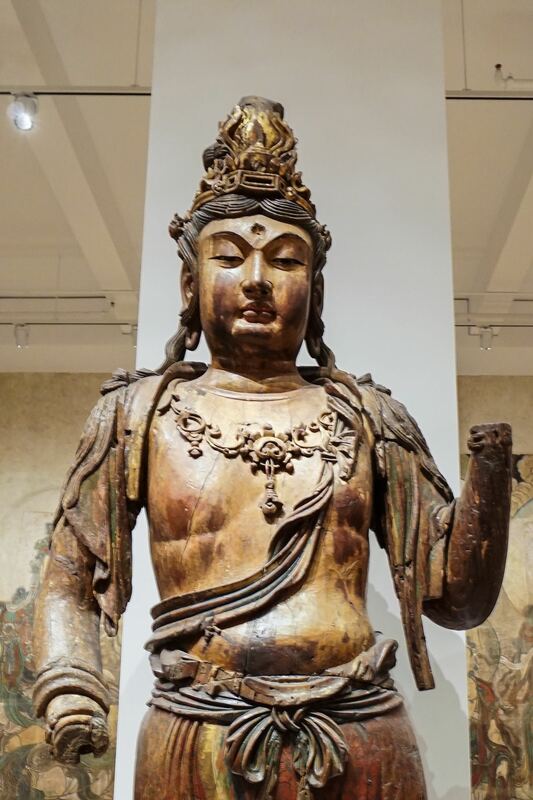 And even though it is the Maitreya, and not the historical Gautama Buddha, he still exhibits some of the features we associate with the latter – i.e. the elongated earlobes ( a sign of royalty) and the ushnisha or bump on the top of his head – originally a topknot or man bun which evolved into a cranial bump! However, he is seated “western style” as opposed to the cross-legged lotus position we associate with the Buddha. His particular hand gestures – referred to as a mudra in Sanskrit – is known as the Abhaya mudra and symbolizes “Have no fear; all is good”. On the bottom left of the mural – we are in the earthy domain now and not in Tusita Heaven – we see the Queen of the Kingdom of Jambudipa – her name is Brahmavati, and her hair is being shorn as a sign of her renunciation of the material world and her position as Queen. A pilgrim standing in front of this mural would have been moved with the knowledge that the Queen would become the future Maitreya’s mother. On the other side of the mural, her husband the King Sankha is undergoing the same haircut. Not clear is who Maitreya’s father was – or whether, like the Zoroastrian Saöshyánt or the Christian Jeshua – he was born of a virgin. More than just trade goods were carried along the ancient trade routes! One of my favourite details of the mural is on the right-hand side. On the seated king’s left a servant is ready to catch his hair with a gold plate. And on his right – his young son wipes away a tear from his eyes, knowing that he is about to lose his father. 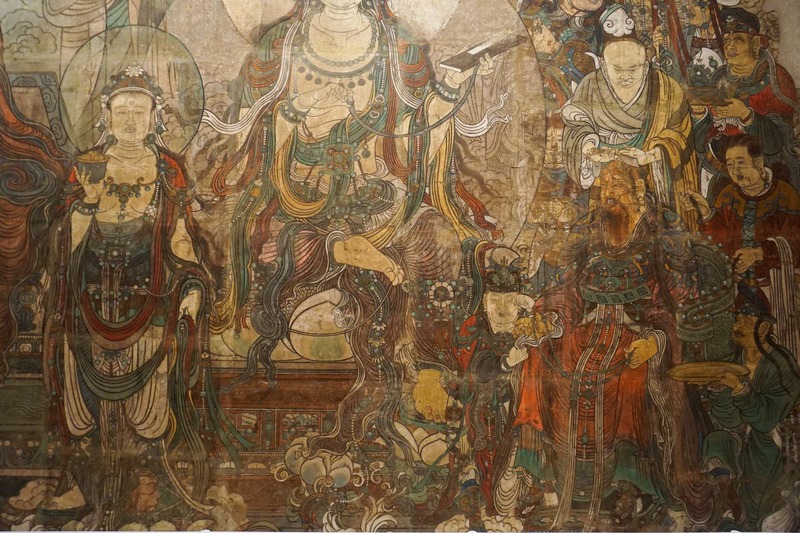 The Paradise of Maitreya – right-hand side of the mural. The Museum has uploaded to YouTube an informative five-minute look at the painting and the story of how it got to Toronto. The R.O.M. 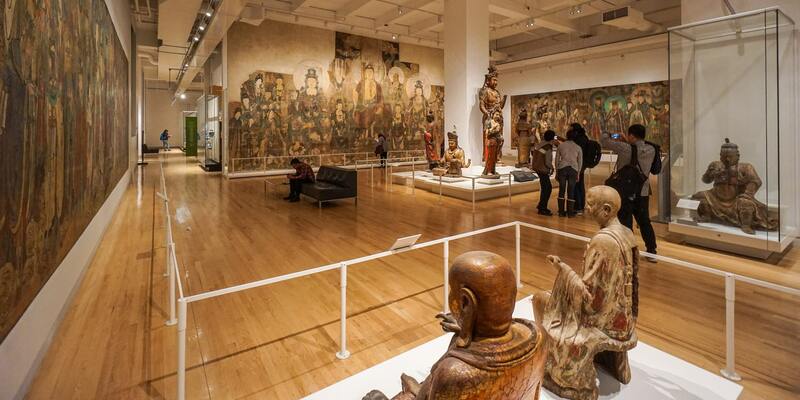 is not the only North American museum with a rare Chinese temple mural on display. 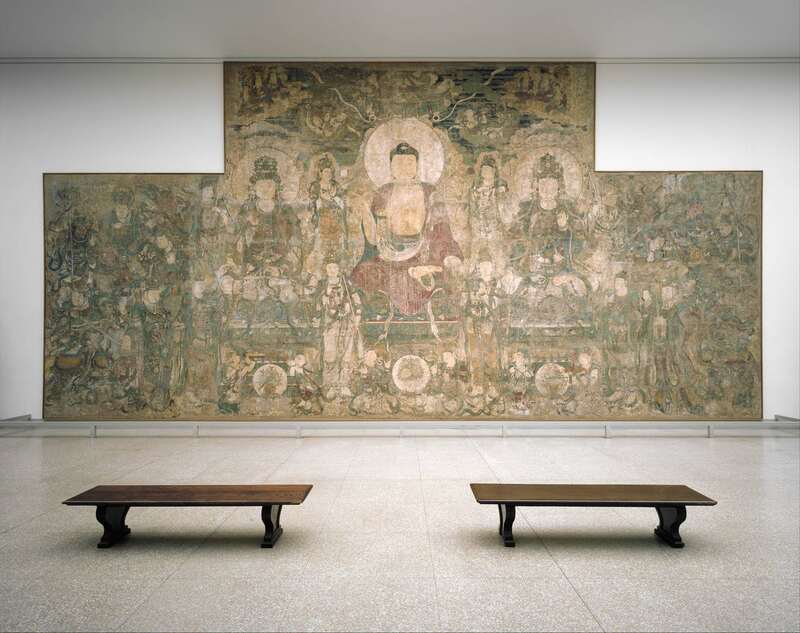 I still remember a mid-1990’s visit to NYC and the morning we spent with a small part of the Metropolitan Museum’s truly incredible collection. 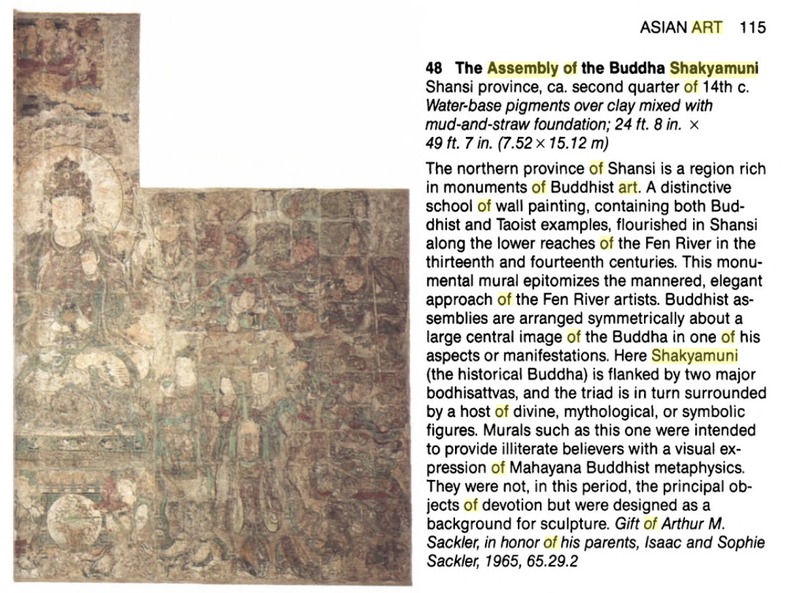 One room that drew me in had a mural from the same Chinese province of Shanxi as the ROM Maitreya mural. It had been donated to the MET in 1966 by a private donor whose father had acquired it in the mid-1920’s. 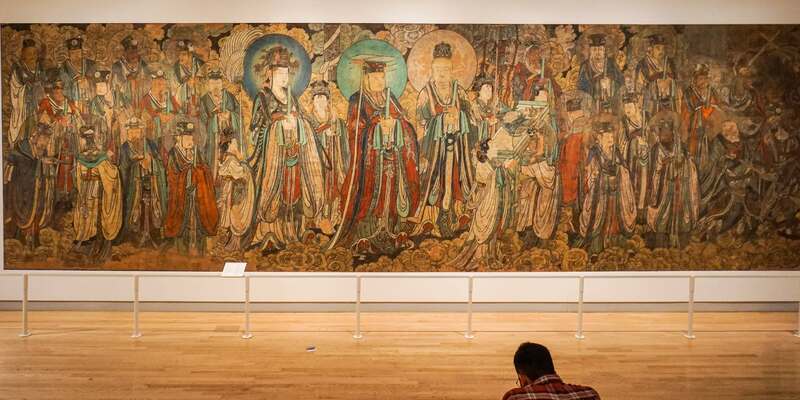 However, a paper by Anning Jing had already appeared in the Metropolitan Museum Journal in 1991 and made the case that the mural had been misinterpreted. 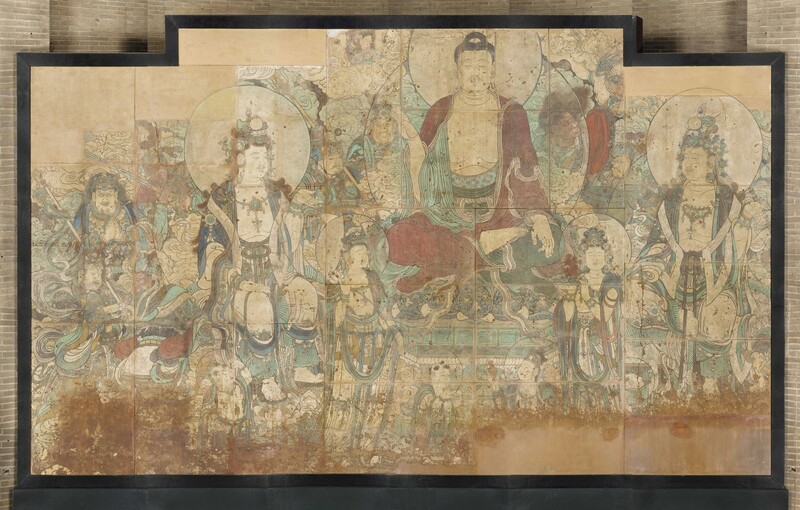 The Yuan Buddhist Mural of The Paradise of Bhaishajyaguru (click on the article title to access) makes for an enlightening tour of the monumental mural and the identity of its many figures. In looking for information about the ROM murals more than just the MET mural popped up. 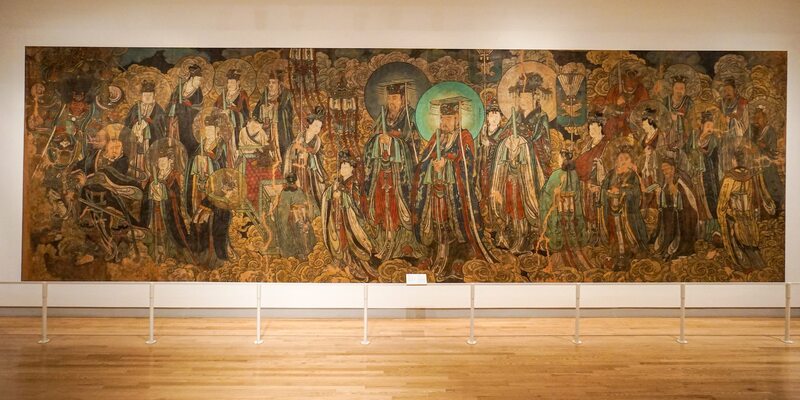 Look at this mural from The Nelson-Atkins Museum of Art in Kansas City. 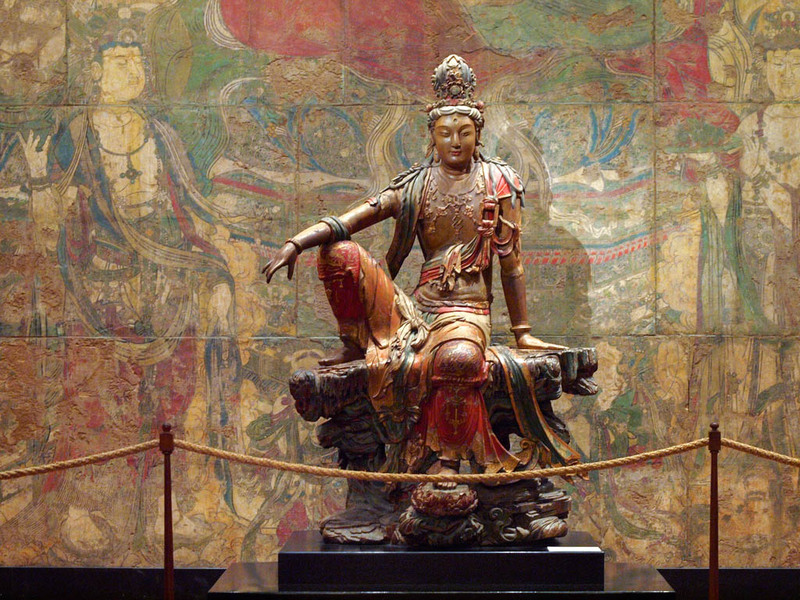 By the way, the Nelson-Atkins is also where a stunning statue of Kuan Yin resides. Having seen images of it before, I had always wondered where it was. Now I know! 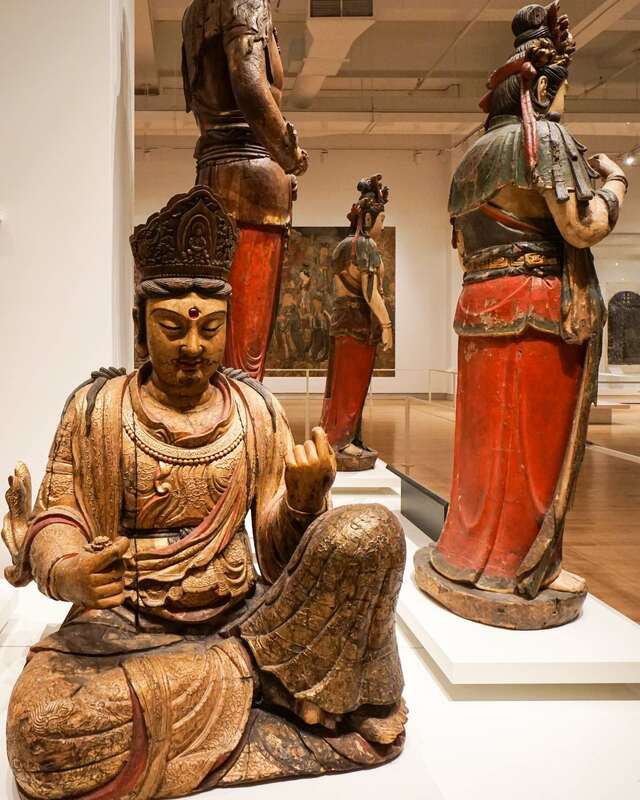 Kuan Yin Statue at the Nelson-Atkins Museum Kansas City. And here are the two murals closer up. 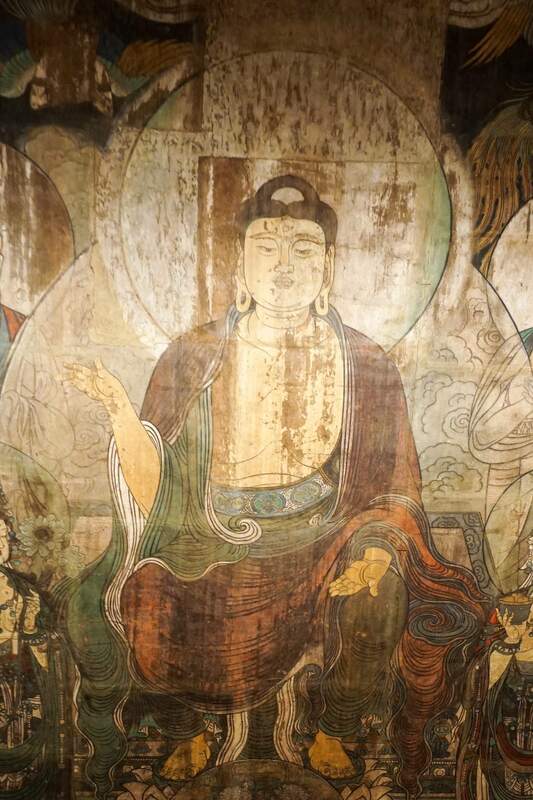 Mural showing Tejaprabha, the Buddha of Blazing Light. Mural showing Bhaisajyaguru, the Medicine Buddha. Until I wrote this post I had no idea all this existed. It’s amazing what you uncover when you start to research just one thing on the internet! Thirty minutes and a dozen clicks later and you are wondering – “How did I end up here?” That’s got to be the curse – and the marvel – of the surfing the ‘net! 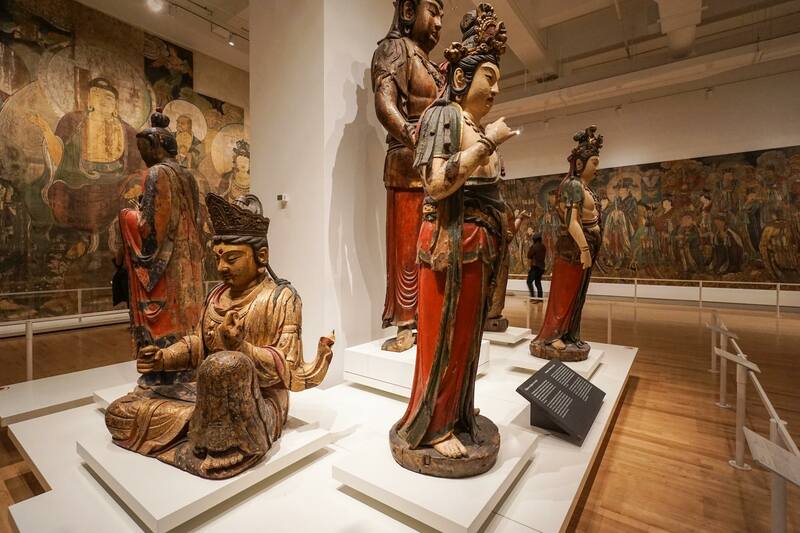 Homage to Heaven, Homage to Earth: Chinese Treasures of the Royal Ontario Museum. 1991. 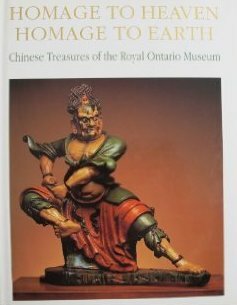 The book is the introduction to the museum’s collection of Chinese art and artifacts, one of the world’s finest. 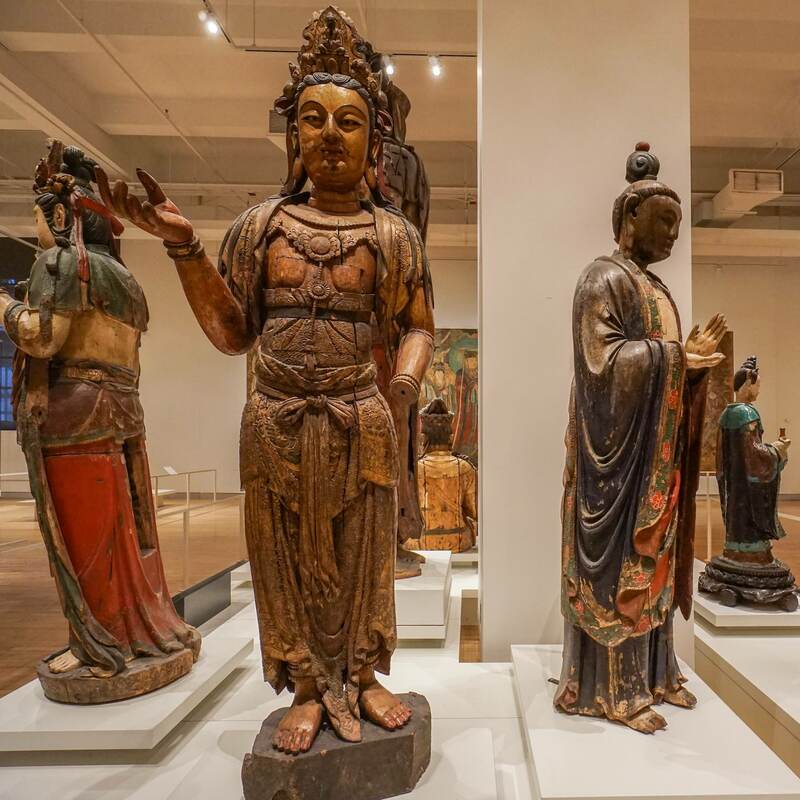 Included is a brief examination of some of the wooden statuary and the Taoist and Buddhist murals. The Toronto Public Library has a couple of copies of the book available for online reservation. See here. Amazon lists a number of used copies from various vendors with $30. being the low price. See here. Sometimes things go wrong and images get mixed up. A Google page ( here) has an example! I think I’ll send them a note! This entry was posted in Buddhism, Toronto. Bookmark the permalink. This is a superb post – I will take the time to read it again before my next visit to the ROM. I am attending the Dior Retrospective tomorrow (and The Vikings in a week or two). The old Bishop White Gallery was set up like a temple and I loved sitting there. It only had one door to the rest of the museum and even seemed a bit darkened. I thought of it as The Bat Cave for mellow adults! The Viking Exhibit was well done but I was flagging by the time I got there – and it was jam packed on a Sunday afternoon. I did not really give it the time it deserves – see it on an off hour or off day! Send me the link to your post on the Vikings – or the Dior Exhibit – if you put something together! Good to know we don’t have to leave T.O. to see the world! I just wish the Bishop White Gallery from the 1980’s was still around with its temple-like feel. Now it is like entering a warehouse!